You’ve heard me talking about this for weeks. Now it’s here!! I hope you’ll join our blogger village to receive and give help with getting seriously old plugins off your site and making it PHP 7 ready. I know I’ve got most of you spoiled to just reading the news I research and deliver. But this time it can’t be just all me doing the work. There are 40,000 plugins in the WP repo alone, and half of them are old. It will take a village to make this a success. And the more of us that join in, the richer a resource we’ll have for everyone. It will take you 15-20 minutes to make your contribution to the old plugins list. And you’ll get all manner of tasty treats too. Think of it like being invited to a super duper potluck dinner. I hope you’ll share this Challenge post with every blogger you know. Email it to them, post it in your blogger groups. Let’s get everyone involved, because everyone who owns a WP site is involved and needs this help. Kim Wende for sharing my posts and Facebook livestream videos this past week. I see you and appreciate you!! I want to send a huge thank you to webmaster and designer Marcy Diaz of Amethyst Website Design for removing the custom coded G+ comments I had on BlogAid. That was great when G+ was my main hang. But it hasn’t been in a couple of years and those comments were above the native comments. In fact, they required a height parameter, which left a long blank spot if there weren’t many G+ comments. And you couldn’t even see that native comments were available unless you scrolled down. Since that coding came out, more folks have been leaving native WP comments and I thank you for doing that. Because we want to keep the conversation going on BlogAid, I’ve been researching comment reply notification plugins. Most of them are seriously out of date. The most popular one hasn’t been updated in over 7 years. In my research for a newer one, I’ve also found a HUGE caveat with the old ones that’s actually increasing spam comment hits. I’ve got a little more research to do and will have a post for you with all the details as soon as I can. Speaking of comments on my post, Micheal Ginsburg left one on last week’s Tips Tuesday addressing my report on the new noreferrer attribute in WP 4.7.4 on any links set to open in a new tab or window. 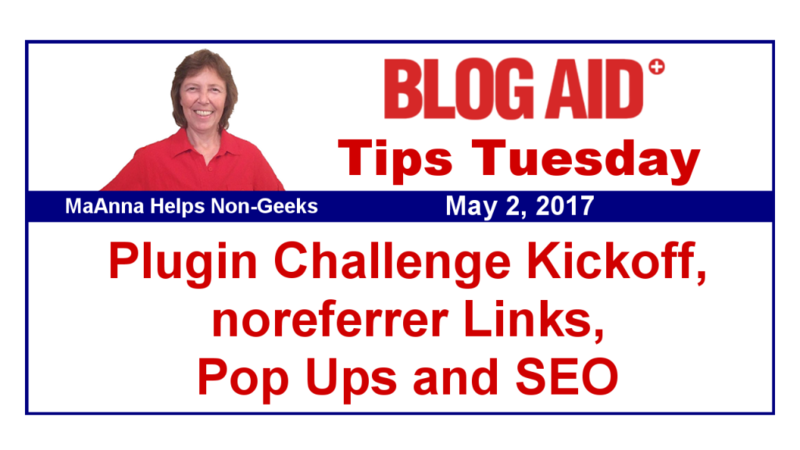 “It seems like there may be a misunderstanding of the difference between ‘nofollow’ and ‘noopener’/’noreferrer’. So, I’ve been doing more research on it and, honestly, I’m finding a ton of misinformation about it, or not enough info. We need both noopener and noreferrer. Noopener alone could fix the security issue. My understanding is that noreferrer was added because FireFox doesn’t support noopener. Now I see reports that FF does support noopener but we still need noreferrer for the older version. Noopener has zero impact on SEO. I’ve seen noreferrer said to have a similar effect to nofollow, and then others say it doesn’t. I can’t find a full description that is recent about exactly what noreferrer does and how each browser deals with it. But we are 90% certain that noreferrer has no SEO impact. The real question is, does noreferrer impact affiliate links? And does it have any effect on tracking for ad links? If you are an affiliate marketer or run ads on your site, please do contact them and let us know what they say. And please don’t send me more articles or forum links with more opinions. I’m following plenty of those already. We want absolute confirmation. Please do leave a comment here on the blog, or anywhere you see this post online, and let’s get to the bottom of this so we all know. As many of you know, I yanked the VaultPress backup service off my recommended list because new accounts now require that you install JetPack, and that comes overloaded with 19 modules turned on by default, many of which also require turning on XMLRPC to work, and that’s a security issue. But, for those of us who were on it before that change, it’s still a good service. I just renewed the annual subscription on one of my sites and was not required to install JetPack to do it. I’ve heard the same from many others too. So, if you have it, keep it for now. As with all backup methods, be sure to restore it once in a while to ensure that it’s actually working and you know how to get through that process. Don’t just assume that it’s getting everything you need. I wouldn’t recommend restoring over your live site. If you can, restore to a sandbox or test site or to a staging area, if your host offers such. Plugins like BackupBuddy and UpDraftPlus let you select files and folders outside of your WP installation. Services like VaultPress and BlogVault do not. So, make sure you backup those other files separately now and then, like your .htaccess and robots.txt and other files that are outside of your WP installation. That’s especially true if you have custom redirects and other such directives in your .htaccess. VaultPress is not the only good service I’ve yanked from my recommended list. I’ve got a post coming for you later this week on why I’m dumping the W3TC plugin for good too. So look for that. New tutorials on the WP Rocket premium plugin are at the top of the to do list next. And those will also include the special instructions for configuring it on an ngnix server too. I want to thank webmaster Timothy Sweeney for the suggestion to make a tutorial on how to remove the emoji support code from WordPress. Most of us don’t use it and it’s a performance drag. So, it’s a good idea to take it out, but does require getting into the code, which is why it will become a webmaster tutorial. If you design or maintain sites for a living, the Webmaster Training courses pay for themselves with how to tutorials and group support that helps make you more money and saves you research time, not to mention frustration. You may recall several months ago that I reported in Tips Tuesday about Google Analytics expanding their Academy program with a beginner level course. If you want to get a peek at that, or hear directly from the Academy director, or have questions for her, now is your chance. Google is hosting a live Q&A session on May 9, and you can ask your question ahead of time too. Use the link above to access the form. I didn’t either until I read this super post from Rand Fishkin on Moz. In his last Whiteboard Friday, he tells us about each one and how they affect your SEO. Well worth a read. But, at the end of the day, we’re all still going to call the pop ups, right? The latest version of Genesis has rolled out and is available for upgrade. This continues the code revamp work that started in the 2.4 release to bring Genesis into compatibility with all the recent core WP changes and to get it ready for PHP 7 compatibility. I looked through the release notes, which are extensive. And what I want to know most are which updates are those that pass through the child theme, and which ones don’t. It’s sort like when they started supporting more HTML5 attributes, including schema markup. We didn’t actually get the benefit of any of that until our child themes were updated to make use of it. Genesis did rebuild the themes in the StudioPress library for that HTML5 support. That’s why all of the themes now have the word Pro after them. But to my knowledge, none of the child themes have been upgraded to include these most recent changes, nor have I heard of any plans to do that. But that’s just it, we don’t have a clue if they need to be updated or not. I’ll be posting about this on the Genesis forum, but I really don’t expect much of an answer. The lead dev, Nathan Rice is not all that fond of taking the time to make too many details available. If you’re a designer on Genesis, why don’t you ask too? If 10-15 of us do, maybe they’ll reply. It takes a village. In case you’re wondering, I’ve updated multiple sites to Genesis 2.5 and they were all fine. Plus, I haven’t heard of any widespread issues. So, I’m calling it safe to update. I read about seo tips on this blog and trust me this is really worthy blog. I, Personally, love Genesis! So this update has been a big deal for me! I always love seeing what value this blog can bring, and I must say, it always over delivers! You’re welcome Nathaneal. I’m delighted Genesis is keeping pace with all of the core WP changes.